This is the kind of thing my kid says these days, as he follows me around, talking. He’s smitten with the card game, Magic the Gathering, and his conversations are pretty much all Magic, all the time. I try to listen to what he’s saying, even though it can be hard. It’s easier to listen with one ear, to keep my own thoughts working in the other side of my brain, and to simply nod my head when his lines seem to end with the lilt of a question. Still, I try to listen with both ears. I try because this is what matters to him, and he wants to share it with me. There’s something lovely in that. Once you have teenagers who talk to you less, you become better at appreciating younger kids who want your ear constantly. The time for those talks is fleeting. I’ve also come to realize that those conversations on topics of passion make writers out of kids. You may remember that in my article How Do Kids Really Learn to Write, one of my recommendations was to talk about what interests them. Yes, even on subjects which may numb your mind, like Magic the Gathering, or Minecraft, or Power Puff Girls. If your kids talk to you about something they’re interested in, they’re likely to want you to understand it. This may not happen if you do that one-eared listening thing, but if you actually try to listen with focus, and react with appropriate responses, kids will pick up on your interest. They want you to be interested. They will begin tailoring their conversation to an audience: you. Which leads to my next point. When kids direct their words to a particular audience, it may shape what they say. They consider your previous knowledge, and modify what they share. When Mr. T talks to me about Magic, for example, he knows that I understand some concepts like mana, which is the game’s energy cost. 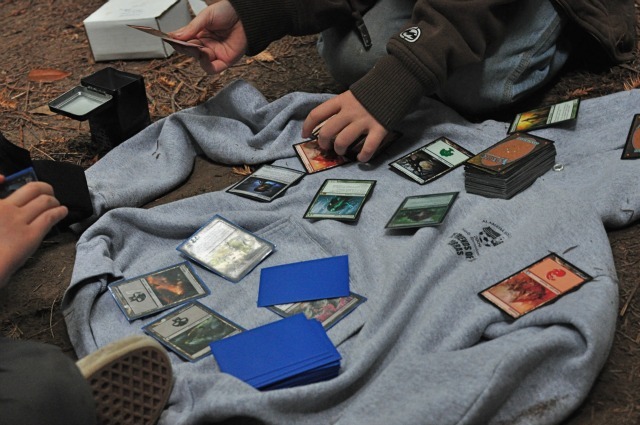 But I may not know the particulars, so he says things like, “For example, Elf Decks tend to have a lot of mana.” Kids may also notice if they’re losing your attention and may subsequently shift what they’re saying. They ultimately learn to speak to a particular audience, you, which is very much like the skill of writing for a particular audience—a crucial ability for a writer. When kids talk about their passions, they’re enthusiastic. When kids speak about a passion, they speak with clarity and detail, because it’s a topic they understand deeply. They will likely include examples to help you comprehend. They may employ language and lingo particular to the topic. And they will learn to use this language and lingo in way that makes sense to you, their audience. They will learn to define when necessary, and let context convey when it can. For example, T told me, “Some cards are overpowered, meaning that their power is higher than their cost.” Also, since kids know what they’re talking about, their words are likely to be clear and purposeful. Detail, examples and clarity are all qualities necessary to good writing. When kids speak about a topic they understand, their sentences tend to flow naturally and logically. One idea leads organically into the next, as their words follow their thoughts. Kids may use transitional words without thinking–I’m always tickled to hear Mr. T incorporate the word however when describing complicated Magic ideas. The more practice kids have speaking on complex topics, the easier it will be for them to write on complicated topics with the same natural, logical flow. Speaking about what they care about can help kids figure out what interests them most about the topic. Because your kids want you to be interested, you can ask clarifying questions based on your own curiosities and confusions. In conversation, your kids won’t likely see your questions as criticisms, but as honest curiosity. When a child begins to write, these same questions may be help them refine their writing. Yet when it comes to writing, such questions often feel like criticism and a parent’s call to improve the work (in a way that the child may not want to improve it.) If you establish this sort of questioning-when-curious practice with your kids when they speak with you, they may be more willing to let you do the same when they write. They may perceive your questions as a natural, curious response to know more, rather than a threat to revise. If you’ve developed a good rapport in discussions, your questions may lead your child to choose to revise. Ultimately, these conversations can be a fantastic transition into a writing project, as happened when Mr. T let that talk with me inspire his Deck-Builders Guide. Most of the time, though, our talks are just talks, with no underlying agenda. I’m simply offering an ear (or two) to my enthusiastic kid, and he’s welcoming me into his wacky, wonderful inner world. And even if he doesn’t realize it, he’s becoming a better writer all the while. What do your kids like to talk about with you? A great post about why it is a good idea to take the time to really listen to our kids. Thanks for stopping by and commenting, Twisted Cinderella! And that passage is what I’m connected to the most because I identify with it. Your kid may talk your ear off but pay attention. Hear them and note. They are showing you how passionate they can be, and if they can get that way about cards (or anything) then you know they will probably become enamored with many things in their life, successful; and if you listen now, then maybe in the future they’ll connect with you in the same way. Let us hope. I agree, Kristin! I think many parents dismiss kids’ passions if their focus is on something “mundane” or based on popular culture. But you’re right: it’s the kid’s excitement that really matters, not the topic that they’re excited about. I love this: “…then you know they will probably become enamored with many things in their life…” That’s right! And then the sky is the limit for them. And I agree that time spent listening to their interests teaches them to care about your interests, and your feedback. Absolutely. Ha ha, Lise! Maybe I should stop complaining about discussions revolving around Magic! P.S. This post is my first pin on my new board on Pinterest: Ideal Education. This is so interesting. I have been reading Susan Wise Bauer’s Writing with Ease and using it some with my 3rd grader. As I read, I wonder, “What would Patricia say about this?” :). She suggests using dictation to help your child with forming words for ideas. She encourages you to use classic works of literature and asking your child to summarize the meaning of the passage. It sounded like a great idea, expose my child to great stories and help him form his thoughts but he is so completely bored with it. I keep with it because one of my main goals in home education is to enable my kids to be able to express their thoughts and ideas clearly and give good reason for why they think what they think. My son does exactly what your Mr. T does. He is constantly telling me about a Star Wars/Ninjago/Transformers plot or telling me in great detail about a story he just acted out while playing. A few nights ago he told me that he now likes Transformers better than Star Wars. This is huge because he has lived and breathed Star Wars for the last 3 years. I asked him to tell me why and he went on and on for the next 30 minutes. It was late and the other kids were in bed so I really had time to listen and ask questions and was so impressed by his thoughts. This sort of thing has happened several times when I take the time to really engage him with him on his interests. I walk away feeling so impressed with his use of language, thought process and grasp of what is going on in the stories. I can really see that if I dictate these sort of things with him I will get so much more from him and there really is so much there in that little head! Thanks so much, this post brings a lot of things together for me. Julie, I’m sure that many English teachers would consider me a heretic. I think that many writers of English curriculum have little faith in kids and parents. They don’t believe that kids will be able to develop skills of expression unless they are taught how to do it with formal lessons. I disagree! Look at how your much your son summarizes for you, as he tells you about what he’s interested in. His conversation about why he now likes Transformers better than Star Wars is the classic stuff of a compare/contrast essay! The fact that you asked him why he likes Transformers better was key: it opened up that conversation for him. You were listening. I absolutely believe that these conversations are helping your son develop his writing skills. Especially if you ask questions–as you did–to help him focus his ideas on you, his audience, so his ideas are clear and understandable. I love sharing classic literature with kids. But, personally, I prefer simply enjoying it with my kids, and letting our own wonderings guide our exploration of it. We tend to listen to the classics via audiobooks because the formal, old-fashioned language of the classics often comes to life better via a talented, professional reader. And then we just talk about what interests us. I’ll never forget my older kids, when they were little, discussing the character of Long John Silver in Treasure Island, in the back seat of the car. Or the discussions we had when they were older, listening to To Kill A Mockingbird and Huckleberry Finn! We didn’t need any preassigned discussion questions, or forced summaries of plots. (That would bore me as much as it bores your son!) We just talked about these grand stories and what we thought about them–and we all loved the conversation. And honestly, those conversations are not terribly different from my son’s chats about Magic. All are conversations based on taking something from the world, and examining it through one’s own lens. As far as I’m concerned, they are all equally valuable. DD9 loves to come out after her siblings are asleep to spend time with me. So tonight we watched a video on mixed media collage and then I told her that I was going to take a shower and she needed to go to bed. Then she complained that she didn’t get to spend time with me. I was confused: “what do you mean? we just sat here together and watched a 20 min. video together. You drew, we talked.” “oh, never mind.” was her answer. So I told her I was going to take a shower and when I came out she needed to tell what was it she wanted me to do. I couldn’t read her mind. She needed to tell HOW was it she wanted me to spend time with her. It’s hard, isn’t it Tereza, to find time to really listen? Especially if you have more than one child. At the same time, isn’t it amazing how much the simple act of listening can offer a child? Becoming a better writer is only a small part of that. I’m convinced that much of what schools try to impart on kids can be picked up, painlessly and joyfully, via casual conversations between kids and parents. Keep doing what you’re doing right, Tereza! you could have been describing a scene in my house with my dd9! what *i* consider spending time with her is not always the same as what *she* considers spending time with me. sometimes she seems so much older and bigger than her younger brother that i forget that she is still young and has a need for snuggle time. i’m so glad that our girls are willing to express to us their need for something different and work with us to discover what that is and make it happen. I have several examples of this in my household of always homeschooled children. My two oldest often shared their interests and “dreams” with each other on a daily basis. Later, these stories ended up the fodder for my fantasy writer daughter’s novels. My oldest son’s first “novels” he wrote, at 11, and then at 17, were based on his favorite RPG video games. Interestingly, my son with autism’s favorite thing to do was listen to his older sibs do “commentary” while playing video games. He also liked when they told stories to him about his interests. During the 11-13 year stage, his older sister mentored him in having confidence in first telling his own stories, and then writing them. So, yeah, good stuff! And there are even more alternative forms of “sharing one’s ideas” besides paper and pencil writing…making movies, stop gap movies, comics, theater, and so much more! It’s about expanding our understanding of what constitutes “writing,” or “expressing one’s ideas.” Great post! Cindy, I just found your comment in my spam folder. Sorry about that! I love all of your examples. They’re outside the box of what we may typically think of as writing, but they’re so rich! The notion of your daughter mentoring your son to tell his own stories and then write them is so lovely and meaningful. And your examples of paper-and-pencil writing alternatives are important for parents to consider. It’s always great to hear from experienced homeschoolers here. I think the newer folks really value the insight offered. Thanks for saying hello! Riding to a cross country meet with an audio book playing. It’s the 2nd book in a series, so I’m lost as to names, places, etc. Harder yet–it’s fantasy, so the key places and characters are stumbling blocks to my ear. It’s not “Chicago” and “George.” It’s Misanthrial and Lorenbough (or some-such-tongue twisting obviously rendered from Tolkien). Son, 11, has me stop the tape at points here and there to recap vital parts from Book 1. He wants me to get into the story. In his summaries, I hear him trying to infect me with enthusiasm and interest, identical to my urgings with him regarding things I love. Yes, and just think of all the book reports you didn’t have to assign because, instead, you took the time (and brain matter) to let your kid ease you into the second book in a series that he loved! Maybe I should add that as a technique in my book: instead of assigning book reports, listen to later books in a series that your kids have enjoyed. Allow them to summarize what the heck happened previously–which they will do because they *want* you to love the book too! Hallelujah to the Amen Corner! I totally have first-hand experience with how this works. The only ‘A’ I got in a college English class was for a paper I wrote about literature genres. I wrote the paper all in one fell swoop and handed it in with only very minor spell-checking and revision. The reason I could do that is because literature is an interest and passion of mine. I am a serious bookworm and have read such a wide range of things that writing a paper comparing and contrasting genres was as easy as holding a conversation, just like you said above. Thanks for reminding me that I need to do this with my daughter now! I love hearing stories like that, Jenetta. I think we parents would do well to consider how we really learned to write–what worked for us and what didn’t. Most writers will tell you that they didn’t learn to write in school. They learned to write by reading, and writing on their own. Being interested in the topic you’re writing about is key! Thanks for taking the time to share your story. i am making more of an effort to show her that she has my attention. i put down whatever it is that i am doing, face her, and actively listen. it sure helps to model that so she knows what i’d like from her when *i* have something interesting to share with her! being a participative, engaged conversationalist with her has given her the confidence, i think, to pursue her writing ideas, because she believes there is someone out there in the world who might be interested in what she has to say. she gets discouraged when she thinks that adults are dismissive of young writers simply because they are children and *obviously* don’t have anything interesting to write about. my encouragement via our talks (initiated by her) validates her belief that kids *do* have important things to say. and she is saying them! she started writing a daily newspaper to report the goings-on in the household (especially with her littlest pet shop toy collection, which is mind-bogglingly extensive, and almost exclusively financed on her own). she shared it with friends and neighbors and teachers and found she *does* have an interested audience among all ages. after spending some time with *all* the aspects of running a newspaper – being journalist, editor, advertiser, printer, distributor, and gopher, managing deadlines and word processing and formatting – she’s decided she really wants to be a journalist. she loves to learn new things and share them with others. if *i* had suggested something like this, it would not have gone well. but *she* came up with the idea, i listened and supported, and she discovered something really cool about herself. and the bonus? she has thanked me, on more than one occasion, for believing in her. imagine what we can all accomplish when we have that kind of support! Dawn, your daughter sounds a lot like my youngest. Talk, talk, talk, talk! I appreciate your insight about how your conversations with your daughter have helped her understand that there is “someone out there in the world who might be interested in what she has to say.” That’s another very important reason for listening intently and conversing with our kids. I love your daughter’s newspaper project! When kids choose a writing project like that, they develop so much as writers. How great that she’s found an eager audience! And it’s pretty wonderful that she acknowledges your role in her learning too. This gives me hope. My first grader talks up a storm, to anyone who will listen. He has a huge vocabulary, automatically uses the correct tense of a word and is very descriptive. However 3 weeks into school, his teacher calls, he isn’t doing his writing assignment which is a one sentence story. The reason he told me turned out to be an elaborate lie/story. I didn’t confront him, I only said that since he is so good at telling me stories then he should have something for the assignment. He only responded with a smirk. It is still sort of a mystery to me. I am not sure if he just had too many ideas to choose just one, maybe his actual hand writing and spelling don’t meet his own expectations, maybe he fears judgment from the class. I haven’t solved yet but for now when he talks to me i tell him how wonderful it is and suggest he writes it on his next assignment. I will have to go back and read more from your blog. Babs, it can be hard, I think, for kids who are talkers to begin to write. It’s simply impossible for them to put on paper what they’re thinking! I wonder if you’ve read my posts on taking dictation from kids. 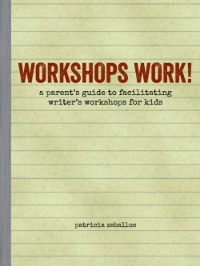 http://patriciazaballos.com/the-dictation-project/ Dictation can be a huge help for kids who have a lot to say, as they develop as writers. 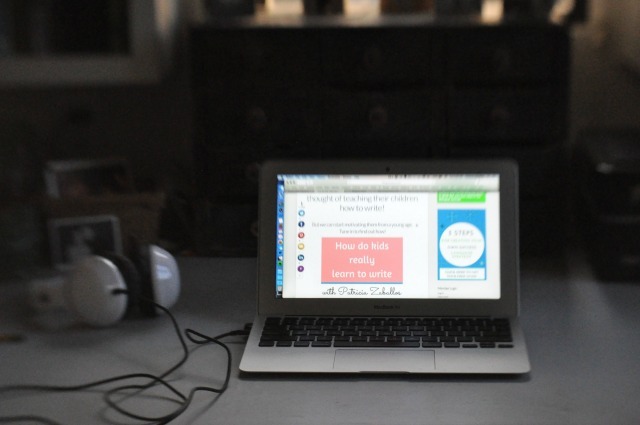 Parents of kids who go to school can try dictation as well. If your son has to write for homework, perhaps you can take dictation and have him submit that. Some teachers are willing to accept homework in this format if it allows the work to be more lengthy and in-depth. If a teacher won’t allow that, you can always take dictation from your son first, and then have him recopy what he’s dictated in his own writing. That allows him to focus on his ideas first, and then the mechanics of handwriting second. This might be beyond what is expected of a first grader, but the expectations for your son’s writing are likely to increase before long. You might also try taking dictation from him on projects unrelated to school. Kids who are talkers often have stories and/or information that they’d love to relay on paper, but that go beyond what they would be expected to write on their own at school. Talkers, in particular, can really develop voice and style as writers at a young age if they aren’t confined by their own handwriting abilities. Thanks so much for saying hello! This is a great article. My daughter talks often about things she loves and sometimes it can be hard to listen fully every time because she can chat non-stop sometimes:) I love that she loves to talk which before this year was not a lot. She was more laid back and quiet. Now, she is a little chatter box who loves to speak. My husband and I read your article and it makes a lot of sense to us and we are going to put our listening ears in to action! I’m glad you liked the article, Shawn. Those little chatterboxes can be a bit exhausting at times! There’s so much potential in the conversations, though, if you make the effort to listen. Thank you for saying hello! When my granddaughter was two and a half – three years old, she would often converse with me in the form of short stories. “I think the rock likes to stay warm in the sun.” Occasionally I would say, “That sounds like a story. Should I write it down?” Sometimes she would make accompanying illustrations. Sometimes the drawings would come first. She is now 4 1/2 and tells her parents long stories with drawings–they type it on the computer and she draws or “paints” on the computer. They then send them to me (they live in Montreal, we live in NJ). I have three volumes of her stories w/illustrations. What a treasure! Somehow this comment snuck in without me seeing it. Sorry about that! What a lovely connection you have with your granddaughter. I’m constantly writing about the importance of authentic audiences for kids’ writing; your granddaughter already has that at 4 1/2. You’re it! Three volumes of stories and illustrations! Wonderful. 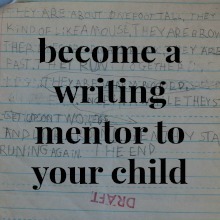 I wish parents would realize how easy it can be to encourage writing, if they start when the kids are quite young. “That sounds like a story. Should I write it down?” is so simple, yet so powerful.